Samenvatting HAP- Mens en Dierkunde 2 Volledige samenvatting van HAP (20306). Inclusief hoorcolleges en alle leerstof uit het boek met bijbehorende plaatjes, tekeningen en tabellen. De hoorcolleges zijn in het Nederlands geschreven, de stof uit het boek in het Engels. Metabolisme en spierfysiologie Elaboration of the powerpoints and the book. The last lesson (muscle building) is just not there. Fysiologie & Therapie A, Compleet A comprehensive and complete summary of all the colleges of the teachers Mr. Scheurink and Mrs. Schmidt of Physiology & Therapy A. The summary consists of 56 pages and contains almost all the important information. Therefore, only this abstract learning should be enough to suffice. 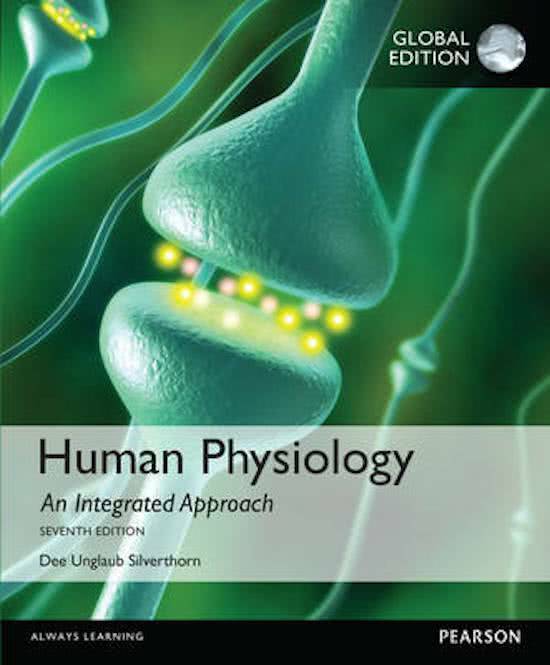 The subject matter treated in this summary comes from the lectures and the book "Human Physiology: An Integrated Approach 7th edition of Unglaub Dee Silverthorn (Publisher: Pearson Education Limited). Physiology - Epiphany Term This document consists of all lectures in Physiology, 1st year Biology, of the Michaelmas Term. En esta página hay resúmenes, apuntes, guías de estudio y mucho más para el libro de texto Human Physiology, escrito por Dee Unglaub Silverthorn. Los resúmenes los han escrito los propios estudiantes, lo que te ayudará a hacerte una idea de lo que es importante estudiar en ese libro. Se tratarán temas como storage, metabolic disease, absorption, anatomy digestive system, biomarkers, digestion, lipids & carbohydrates.